The earliest Cadillac might arguably be deemed a Henry Ford-built Detroit Automobile Company delivery truck first completed in 1900. 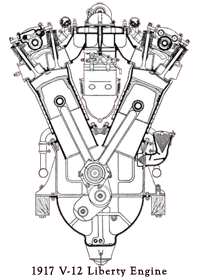 The Liberty 400-horsepower (298-kilowatt) V-12, air-cooled engine was one of World War I's most powerful engines and one of the workhorses of the war. Designed to be mass-produced with interchangeable parts, the Liberty became the standard wartime aircraft engine, produced by Packard, Lincoln, Ford, General Motors (Cadillac and Buick), Nordyke, and Marmon. It was used most often on the DH-4, the only U.S.-made airplane to go into combat on the Western Front. More than 13,000 engines came off the assembly line before the Armistice, and more than 20,000 were built by the time wartime production ended early in 1919. The 1952 Cadillac 2-door Coupe DeVille. Those few of us Americans remaining among the great unwashed of the 21st Century [e.g., those of us who aren't investment bankers, stock speculators, corporate vice presidents, upline AmWay dealers, dentists, plastic surgeons, or plumbers] have all seen--or perhaps been privileged to actually ride in or even drive--a Cadillac motor car sometime during our lifetime. With the rapid decline of the American Automotive Industry since the Reagan Years the 'Cadillac patina' has somewhat lost its sheen. But most of us of a certain age can certainly relate to what the Cadillac marque represented for the better part of 80 years of the 20th Century. And those of us of that certain age all have some memory, however obscure, arcane or oblique of what those first visceral impressions of a Cadillac were--first-hand. Throughout the Golden Age of Radio era the mere utterance of the word 'Cadillac' invariably conjured up notions of luxury, wealth, and success . . . and perhaps even more visceral sensations of cigar smoke, the smell of leather, the clinking in the passenger compartment of carafes of sherry or wine glasses, that luxurious squeak that only genuine leather seats make, and a general sensation of 'having arrived' . . . or in the case of those whose only physical experience with a Cadillac was in an ambulance or a hearse, 'having departed.' There's a certain cosmic symmetry to that observation, dontcha think? In fact--and this will undoubtedly come as an even greater shock--American automobiles and trucks throughout that era were without question considered the very finest throughout the world. And throughout that same era, the Cadillac brand was considered the very finest of the fine throughout the world. Potentates, Rajahs, Kings, Queens, Princes, Emperors, Military Generals or Admirals, and of course plumbers the world over, were among the largest block of foreign buyers of Cadillacs. And most shocking of all, almost no lobbyists of that era could even begin to afford to buy a Cadillac--with the possible exception of lobbyists for the Plumbing Industry. Cadillac: The second oldest automotive marque in America? Henry Ford's first attempt at the automotive industry had been the Detroit Automobile Company, founded by--then--auto mechanic Henry Ford in 1899, with the investment support of Detroit's Mayor William Maybury, William H. Murphy, and U.S. Senator for Michigan, Thomas W. Palmer. The Detroit Automobile Company ultimately foundered less than two years after its founding, having produced a total of twenty vehicles in all. The company reorganized in November of 1901 with new backing as the Henry Ford Company, owing mostly to Henry Ford's early racing successes. But the Henry Ford Company went bust by March of 1902. Henry Ford left his second company with a total of 900 dollars in capital and his name. Ford ultimately used that 900 dollars--and even further investors' contributions--to form the Ford Motor Company in 1903--the company that bears his name to this day. Vermont-born Henry Martyn Leland had learned his engineering and machinist skills throughout New England during the second half of the 19th century. By 1870 he'd become a principal in the firm of Leland & Falcouner, a cutting edge [no pun intended] machine shop of the era which had begun supplying engines to the those crazy Olds Brothers. He'd also invented electric barber shears and owned several machining technology patents. 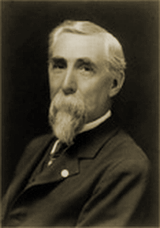 By the turn of the 20th Century, Henry Leland's reputation had spread throughout the Manufacturing sector of the U.S. and beyond. After Henry Ford's second automotive endeavor went bust the Henry Ford Company's remaining investors approached Henry Leland to assess the value of the company's plant and tooling prior to a final liquidation of the firm. Leland countered by advising the investors to reorganize the company around a new single-cylinder motor Leland had already developed for the Olds Brothers with proven success. The Henry Ford Company ultimately took Leland's advice, reorganizing as The Cadillac Automobile Company on August 22nd 1902 with Leland & Falcouner Manufacturing supplying the new Cadillac engines. 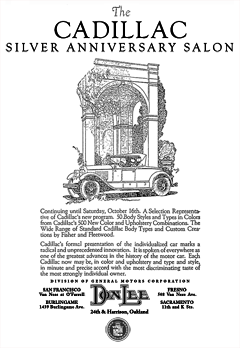 Leland & Falcouner merged with The Cadillac Automobile Company in 1905 and by 1908 had been awarded the Royal Automobile Club of England's prestigious Dewar Trophy for Cadillac's "most important advancements to the automotive industry" for 1908. The company continued to place its greatest concentration on precision, manufacturing interchangebility, and the highest reliability in its component parts. 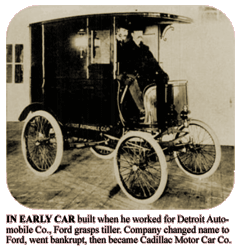 Henry Leland ultimately sold his interest in Cadillac to General Motors in 1909 for a reported $4.5 Million [approx. $104 M in today's dollars], while staying on as an executive with General Motors' resulting Cadillac Division until 1917. After leaving General Motors, Leland founded the Lincoln Motor Company in 1917 on the strength of a $10M military contract to build the V12 Liberty Engine. After World War I ended, the Lincoln Motor Company retooled to manufacture luxury automobiles featuring a Lincoln V8 engine based in part on the powerful, war-proven V12 Liberty Engine. First volume manufacturer of a fully enclosed cab in (1910). The dual-plane V8 crankshaft (1918). First volume manufacturer of an automotive electrical system combining starting, ignition, and lighting (1921). The first clashless Synchro-Mesh manual transmission (1928). The first production V-16 engine (1930). The first overhead valve, American V8 engine (1949). In every field of human endeavour, he that is first must perpetually live in the white light of publicity. Whether the leadership be vested in a man or in a manufactured product, emulation and envy are ever at work. In art, in literature, in music, in industry, the reward and the punishment are always the same. The reward is widespread recognition; the punishment, fierce denial and detraction. When a man’s work becomes a standard for the whole world, it also becomes a target for the shafts of the envious few. If his work be mediocre, he will be left severely alone--if he achieves a masterpiece, it will set a million tongues a-wagging. Jealousy does not protrude its forked tongue at the artist who produces a commonplace painting. Whatsoever you write, or paint, or play, or sing, or build, no one will strive to surpass or to slander you unless your work be stamped with the seal of genius. Long, long after a great work or a good work has been done, those who are disappointed or envious, continue to cry out that it cannot be done. Spiteful little voices in the domain of art were raised against our own Whistler as a mountebank, long after the big world had acclaimed him its greatest artistic genius. Multitudes flocked to Bayreuth to worship at the musical shrine of Wagner, while the little group of those whom he had dethroned and displaced argued angrily that he was no musician at all. The little world continued to protest that Fulton could never build a steamboat, while the big world flocked to the river banks to see his boat steam by. 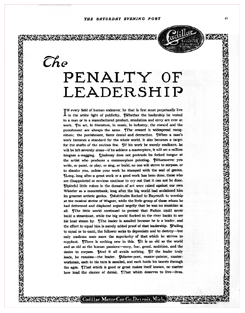 The leader is assailed because he is a leader, and the effort to equal him is merely added proof of that leadership. Failing to equal or to excel, the follower seeks to depreciate and to destroy - but only confirms once more the superiority of that which he strives to supplant. There is nothing new in this. It is as old as the world and as old as human passions - envy, fear, greed, ambition, and the desire to surpass. And it all avails nothing. If the leader truly leads, he remains--the leader. Master-poet, master-painter, master-workman, each in his turn is assailed, and each holds his laurels through the ages. That which is good or great makes itself known, no matter how loud the clamor of denial. That which deserves to live--lives. Following the recent announcement of the entrance of the Cadillac Motor Car company upon its 25th year, of production with a manufacturing program of 50 body types-and styles and 500 color and upholstery combinations, distributors and dealers of the company in the 300 cities throughout the United States will hold, October 3-16, a silver anniversary salon, displaying outstanding models of the new line. On account of the number and variety of the new body models, in addition to displaying in the usual show rooms, many distributors and dealers have found it necessary to obtain exhibition halls or auditoriums to secure an adequate setting. show than of a salon of an individual manufacturer. Included in the exhibition will be striking examples of Fisher Fleetwood coachwork, as well as creations by individual custom coach builders. The Cadillac Motor Car company has just completed the final unit in its 25 million dollar building and equipment program which was begun seven years ago, and during the past two years, investments in new buildings and equipment for expansion have totaled over five millions. Sales and deliveries during the twelve months periods preceding the announcement of the new line which will be displayed in the Salon had increased 87 1/2 per cent, and the manufacturing program for the current season calls for even further expansion. Four entirely new body models have recently been added to the Cadillac line: further refinements have been added to others: and in the Fisher custom-built line the five-passenger sedan, five-passenger coupe, the suburban and Imperial are also now produced in cabriolet style with leather back. 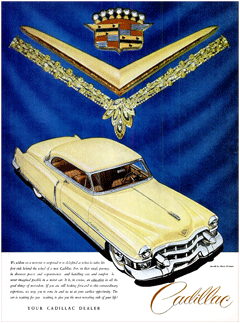 Cadillac marked its Golden 50th Anniversary throughout the 1952-1953 model year with several specialty models and a major publicity campaign throughout the Print media of the era, via Film tie-ins, over Radio, and over Television. 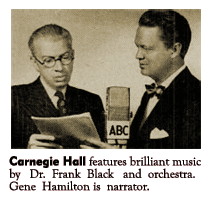 Dr. Frank Black had been a brilliant jack of all trades in the music world between the 1920s and 1953. Uncharacteristically versatile for conductors of the era, Frank Black's range of music interests spanned honky tonk jazz to combined choral and instrumental long-hair Classics. And though a life long adherent to the 'taskmaster' school of conducting, Frank Black was possessed of a biting good humor, quickness of quip, and an uncharacteristic approachability--as temperamental conductors go. 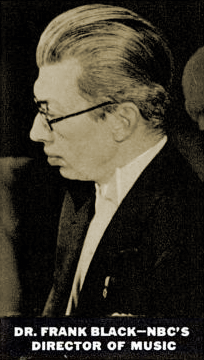 Throughout the late 1920s to 1940s, Frank Black was NBC's Music Director. He'd launched NBC's remarkable The Magic Key of RCA hour as its music director and composed the beautiful theme music for the series. The Magic Key (1935-1939) was the NBC analog to CBS' equally historic and ambitious Columbia Workshop (1936-1947) series and featured some of the most cutting edge advancements in Radio technique and technology as had ever been heard over Radio--and for as many as 20 years later, for that matter. 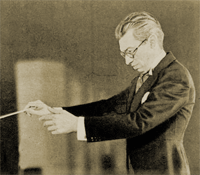 Equally adept at arranging for both chorus and orchestra, Frank Black's innovative arrangements regularly caught the attention of composers such as Jerome Kern, Rogers and Hart, George Gershwin and Irving Berlin and entrepreneurs such as Flo Ziegfeld. 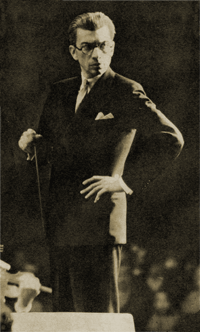 Prior to his stint as NBC's Music Director, Frank Black had proven himself equally at ease with the most popular music of the college crowd of the 1920s with wax hits like The Varsity Rag, I'm Looking Over A Four Leaf Clover, and The Best Things in Life Are Free. After Frank Black left NBC, he'd devoted most of his energy to his writing, hobbies, and occasional work on light operas, Hollywood patch ups, and Television. But it was Frank Black's brilliant, innovative work with choral groups large (The Magic Key) and small (The Revelers) that persuaded Cadillac to mount an attempt to coax Dr. Black back to Radio for Cadillac's splashy Golden Anniversary advertising campaign. 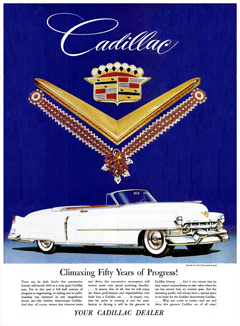 Cadillac's catch phrase for forty-six of its fifty years had been "Standard of The World" and it's clear that Cadillac's 1952-1953 campaign had to be unrelenting in it's own standards. The choice of Dr. Frank Black was Cadillac's answer to maintaining that standard over its Radio campaign. 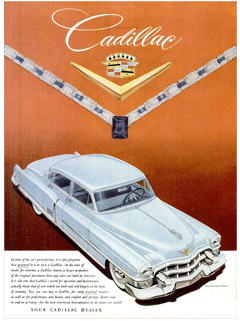 As with the hundreds of thousands of dollars worth of fine jewelry that adorned all of Cadillac's 1952 to 1953 Print ads, Dr. Frank Black and the 22-voice, all-male Cadillac Choral Symphony he assembled for Cadillac's program of the same name, represented the finest of the fine for Cadillac's Radio campaign. Cadillac dealers of the era also played transcription discs or tapes of the Cadillac Choral Symphony in their showrooms. RADIO PIONEER: Dr. Frank Black, conductor of CBS Radio's "Choral Symphony," was a pioneer in radio. His first broadcast, just 30 years ago, was a piano recital over station WOO in Philadelphia. It lasted, Black recalls, about an hour and a half. No one bothered to time the program and he played just as long as he pleased. The first "network" over which he broadcast consisted of two stations, one in New York, the other in Schenectady. His orchestra was advertised as "the largest orchestra on the air" and had difficulty crowding into the regular broadcast studio. It consisted however, of only 22 men, a vast number of players for those days. Black first had the idea of starting a music library for a radio station and was the first to record programs for future broadcasts. There was little formality about such things, he recalls. He merely picked the music he wanted to record, got together his orchestra, went to the studio, which was manned by one engineer, and conducted his programs. The announcer ad libbed the musical data as he went along. "Our announcer believed that every march was composed by Sousa," recalls Black. The Cadillac Choral Symphony premiered in the Spring of 1953 as a 15-minute, thirteen-week production under the total control of Dr. Black--and as it turned out, a wise decision indeed. Frank Black's premiere presentation of his arrangement of Sergei Rachmaninoff's masterful Prelude in C-Sharp minor, scored by Dr. Black with a lyric setting specifically adapted for his 22-voice male Chorus--The Cadillac Choral Symphony--as Dr Black's original composition, Bells At Eventide. Accompanied by pianist Joseph Kahn, Dr. Black's original arrangement for the chorus set the tone for the twelve installments that followed. Anyone who's heard Rachmaninoff's brilliant piece scored for piano can literally feel the hairs standing up on the back of their necks as Black's male chorus brings remarkable new life to the piece Rachmaninoff himself first performed in 1892--at the ripe old age of 19. 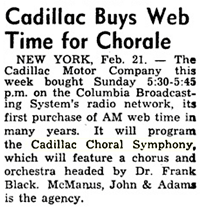 Cadillac prominently promoted all thirteen weeks of the series from beginning to end, with spot ads in all of the newspapers serving the areas in which the Cadillac Choral Symphony aired. And from beginning to end, the Cadillac Choral Symphony was absolutely brilliant Radio, and certainly the appropriate vehicle to further promote Cadillac's year-long 50th Anniversary Celebration. 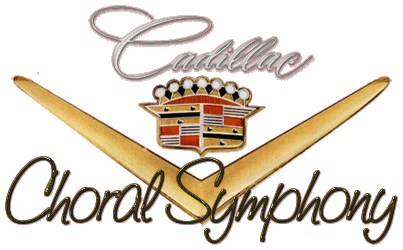 Cadillac's only other programs to air during the Golden Age of Radio were the Cadillac Symphony Orchestra series in 1933 and The LaSalle Style Show with Eddy Duchin in 1936. Cadillac's last entry during the Golden Age Radio was a fitting tribute and celebration of the standards and excellence that exemplified the Cadillac marque throughout its fifty-year history. The Cadillac Choral Symphony remains yet another of the sadly overlooked gems that remain preserved from Radio's most remarkable era. Run Dates(s)/ Time(s): 53-03-15 to 53-06-07; CBS; Thirteen, 15-minute programs; Sundays at 5:30 p.m. The most helpful provenances were the log of the radioGOLDINdex and newspaper listings. The OTR Community--and only the OTR Community--lists the Cadillac Choral Symphony as either 'Frank Black Cadillac Show,' 'The Cadillac Show,' or 'The Frank Black Show,' none of which was the title for this marvelous 13-week program. That may help to explain why no one's attempted to properly document this fine program--no search of any newspaper or print archives would have disclosed any of those erroneous title. What you see here, is what you get. Complete transparency. We have no 'credentials' whatsoever--in any way, shape, or form--in the 'otr community'--none. But here's how we did it--for better or worse. Here's how you can build on it yourselves--hopefully for the better. Here are the breadcrumbs--just follow the trail a bit further if you wish. No hobbled downloads. No misdirection. No posturing about our 'credentials.' No misrepresentations. No strings attached. We point you in the right direction and you're free to expand on it, extend it, use it however it best advances your efforts. We ask one thing and one thing only--if you employ what we publish, attribute it, before we cite you on it. We don't pronounce our Golden Age Radio research as 'certified' anything. By the very definition, research is imperfect. We simply tell the truth. As is our continuing practice, we provide our fully provenanced research results--to the extent possible--right here on the page, for any of our peers to review--or refute--as the case may be. If you take issue with any of our findings, you're welcome to cite any better verifiable source(s) and we'll immediately review them and update our findings accordingly. As more verifiable provenances surface, we'll continue to update the following series log, as appropriate. All rights reserved by their respective sources. Article and log copyright 2011 The Digital Deli Online--all rights reserved. Any failure to attribute the results of this copywritten work will be rigorously pursued. Several new programs due Sunday include: CBS 5:30, Dr. Frank Black returns to the air to conduct a new choral symphony series made up of a 22-voice male chorus and orchestra. 4:30 p.m.--Choral Symphony (WBBM): new series conducted by Dr. Frank Black. 4:30 p.m.--Choral Symphony (WBBM): "Tea for Two," "Kentucky Babe," "Juanita." 4:30 p.m.--Choral Symphony (WBBM): "This Nearly Was Mine," "Ezekiel Saw de Wheel," "The Rosary." 3:30 p.m.--Choral Symphony (WBBM): "Without a Song," "To a Wild Rose," "I'm an Old Cowhand." 3:30 p.m.--Choral Symphony (WBBM): "Trees," "Haunted Heart," "The Girl That I Marry." 3:30 p.m.--Choral Symphony (WBBM): "O, What a Beautiful Morning," "Mighty Lak' a Rose," "Ol' Man River." 3:30 p.m.--Choral Symphony (WBBM): "Blue Skies," "Ramona," "Indiana." 3:30 p.m.--Choral Symphony (WBBM): "We Kiss In the Shadow," "Summertime," "The Bells of St. Mary's." 3:30 p.m.--Choral Symphony (WBBM): "My Moonlight Madonna," "Go Down, Moses," "The Blue Room." 3:30 p.m.--Choral Symphony (WBBM): "Begin the Beguine," "If I Loved You," "Camptown Races." Pennsylvnia-born Frank Jeremiah Black was the son of a Quaker dairyman. As a boy, Frankie Black had earned extra income by playing the upright piano at the area nickelodeon. Eschewing the family dairy business, Frank Black enrolled instead at nearby Haverford College to pursue a degree in Chemistry. Black rediscovered Music while in college. His new found passion for Music took him to New York where he reportedly studied under renowned Hungarian pianist and composer, Rafael Joseffy. When it came time to pay the bills Frank Black applied his talents to scoring for vaudevillians and other odd journeyman music work. Bu the age of 21, his growing reputation found him scoring music for Tin Pan Alley and Broadway. Between 1921 and 1926 Frank Black was scoring music, writing arrangements, and directing Broadway and off-Broadway musicals for George and Ira Gershwin, Rogers and Hart, Jerome Kern and Florence Ziegfeld. In 1926 Frank Black began working with The Revelers, a popular male quartet of the era. Black's arrangements for The Revelers propelled the group to several hit recordings of the era and a 1927 Vitaphone Short, The Revelers. Frank Black later applied his experience scoring for The Revelers' close-harmony arrangements to several series' featuring even larger male choruses for the following 25 years. In the young business of radio, the oldest continuous network commercial program is the Cities Service Concert (age 12), selling motor oil and gasoline. Last week Cities Service signed up for its 13th year over NBC. Like many another radio old timer, the Cities Service program got its start with Graham McNamee announcing. First feature was silvery Edwin Franko Goldman's cornety band. When the program was a half-year old, Canadian Conductor Rosario Bourdon took over, be gan making the Cities Service hour the big-time show it is today. He handed the baton over last February to Dr.* Frank Jeremiah Black, an old timer, too. Frank Black will conduct the Cities Service hour 52 Friday nights. He will also continue to be NBC's musical director, conduct the RCA Magic Key concerts Sunday afternoons, run his NBC string symphony this summer, oversee NBC's vast music library, dash off arrangement  popular or high-brow  which are the envy of the profession. For all this he will collect some $100,000. A whimsical, greying man of 44, Philadelphia-born Frank Jeremiah Black can look back through his heavy horn-rimmed cheaters on 25 adventurous years in music As a boy he played the piano in a nickelodeon. University of Pennsylvania turned him out a chemist, but piano-pounding in a Harrisburg hotel offered better money. From then on he stuck to music, studied under Organist Charles Maskill and Pianist Rafael Joseffy, applied this talent to writing vaudeville songs, editing for a Philadelphia music publisher, and running his own player piano roll company. He used to pound rolls out by the yard, under some 20 different namesPreston Dupre for the classics, Cyril Crossing for tangos, other Frenchy names for "saluts d'amour," etc. In 1916 he came to Broadway and Tin Pan Alley, arranged and directed musicals for Jerome Kern, Rudolf Friml, Ziegfelu, Rodgers & Hart, Gershwin. He arranged the swipes that made the Revelers quartet a popular and much plagiarized sensation in the late '20s. Most exciting season in Frank Black's career was 1936-37. With the Carnation Milk program to direct in Chicago Monday nights and the Magic Key in Manhattan Sundays, he commuted by air between the two cities for 58 weeks. To give air travel its due, he never missed an engagement. But in those 58 weeks, he "ran the entire gamut of airplane adventure except for being killed." He was gashed and kayoed when bumpy air over the troublesome Nittany Mountains conked him against an overhead baggage rack. He once watched ambulances gather below him at Newark when his ship could not get its landing gear down. He weathered innumerable forced landings and is one of the few air travelers who ever landed on an airport backwards. On that occasion the pilot overshot Chicago airport, bounced off the far end of the runway, cleared an embankment, and fetched up in a soggy meadow. The passengers sat, wondering what next, when suddenly the grounded airliner started backwards out of the swamp, rumbled over the embankment and back on the runway tail first, towed, they soon found out, by an airport tractor. Frank Black, who finds the lofty detachment of air travel just the ticket for writing arrangements, still likes to fly. *Of Music, Missouri Valley College, 1935.